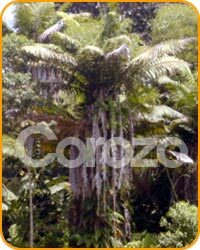 The COROZO (a.k.a. 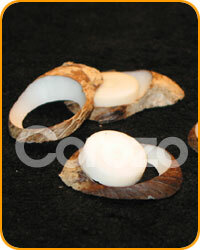 TAGUA) NUT refers to the seed of the TAGUA palm tree native to equatorial South America. This tree grows very slowly and bears fibrous nuts in 15 years. 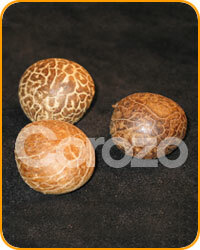 If this fruit falls to the ground when fully ripe, it is harvested and dried under the tropical sun for about 3 months. 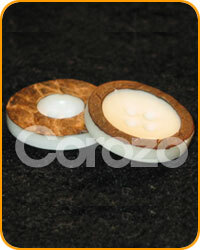 Then the gelatin of the nut ripens and becomes a hard white substance resembling animal ivory. 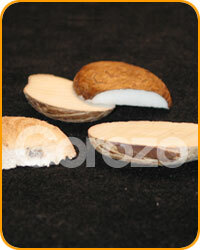 As this fully dried COROZO NUT is used as substitute for animal ivory, it is sometimes called IVORY NUT. After drying, the nuts are husked by machine and sorted by size and quality. They are sliced thinly so that they can be used as raw materials for buttons, and then they are processed according to button sizes. 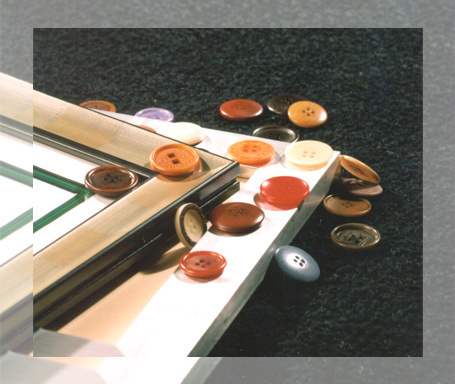 In fact, the COROZO BUTTON has been produced in Italy since the 19th century, and used as decorations for the finest garments of the world. At one time it took a backseat to low-priced plastic buttons and was in poor demand, but in recent years as people began to look at natural materials in a new light, its applications are increasing dramatically. 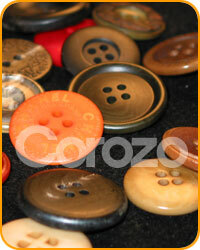 Along with the BUFFALO HORN BUTTON, it is maintaining its reputation as a top-of-the-line natural material. In addition, the COROZO NUT is used as various accessories, chess pieces, and reeds for musical instruments, and the powder left over from the manufacturing process is used as feed for animals. 3. Cut to fit the thickness of a button. 6. Voila! We have a nice button. 5. Make holes for threads.